Confisco Grille is one of two full-service restaurants in Islands of Adventure. (The other is Mythos Restaurant.) Although Confisco is a full-service restaurant, it should not be considered fine dining. The atmosphere is very casual. The Confisco Grille menu is eclectic and includes a range of dishes from various cultures. You can find everything from Mediterranean to Asian food. Prices are slightly higher than the prices at some of the quick service restaurants in the park - but not by much. Confisco Grille also has a children's menu with items that are more kid friendly than the regular menu. For example, kids ages 9 and under can order chicken fingers or a grilled cheese. 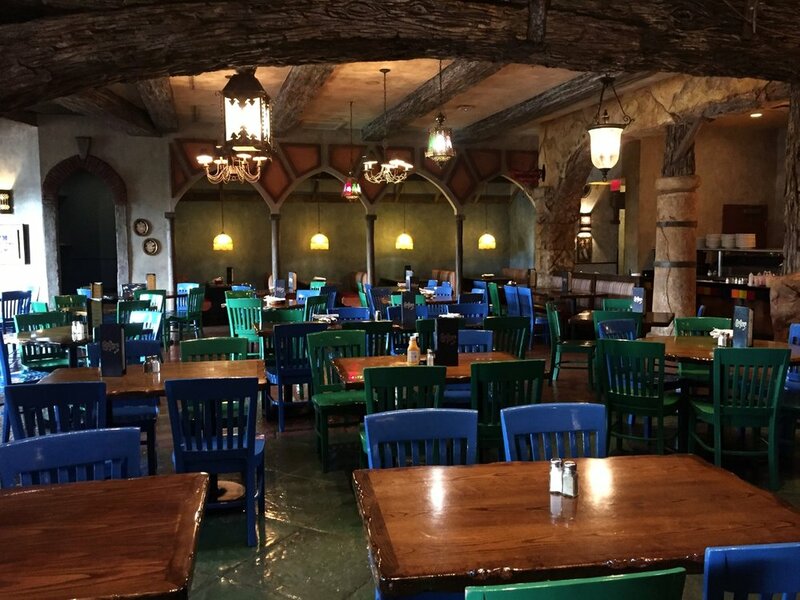 Confisco Grille is located in Port of Entry in Universal's Islands of Adventure. It is one of the last things in Port of Entry on the right hand side before you reach Seuss Landing. Port of Entry is meant to look like a port city, and Confisco Grille is supposed to be the customs house (and office where customs duty is collected). The word confisco is Latin for confiscate, and you can find lots of "confiscated items" on shelves throughout the restaurant. Many of these items are clearly confiscated from other islands around Islands of Adventure. Be sure to look around to see if you recognize anything. Confisco Grille usually opens daily at 11:00 am. Closing time is typically one hour before park close. However, Confisco Grille may close earlier in the day during slow times. Visit Confisco Grille or Guest Services to check opening and closing times on the day you visit. *Menu last updated February 2018. Items marked with (GF) can be made gluten free. Items marked with a (V) can be made vegetarian. Backwater Bar is a small bar next door to Confisco Grille. It can be accessed from its own entrance or from inside Confisco Grille. Seating is available inside and outside of Backwater Bar. There are lots of drinks to choose from on the Backwater Bar menu. You can also order food from the Confisco Grille menu while you relax inside or outside of Backwater Bar.